I find that the Skywave is so stable on the air band, I can use it to decode ACARS with the Android App! Listened to WBCQ, and Arnie Coro’s show last night from Havana along with some Jazz music. It pulled FM stations out of the air like nothing else, meaning the weaker ones here in my rural Ohio location. And I could pick up three NOAA broadcasts, two very strong, one scratchy…. Since the NOAA system is of course designed to let you pick up one station in whatever particular area of the county you live in, I consider this excellent! With the AM I pulled in Canadians, Boston , stations in IOWA and KFI. I also note it’s very directional on AM… I could null out WTVN and pick up Texas with no problem. I have owned and do own lots of shortwave radios, and I MUST say, this is one hell of a good set! It’s going into my Winter zip-up jacket pocket so it will always be handy for the DX Season, and I also notice that the headphones are VERY good, and have a long enough cord so it’s not pulling at my ears like some sort of damned harness… I HATE short earphone cords! First of all, thank you for making me aware of the ACARS app and that you can successfully use it with the CC Skywave. I will add the ACARS app to my growing list of HamRadio/SWL applications and also try it myself! Your experience with the CC Skywave is very similar to mine. It is a fabulous portable receiver. If it only had SSB and sync detection, it would be the ultimate compact portable. The CC Skywave is an everyday carry (EDC) radio for me–either it, or the Sony ICF-SW100, accompany me everywhere in my Timbuk2 messenger bag. Regarding static discharge from headphones, I don’t think I’ve ever had this happen to me; sounds annoying, though! I suppose walking in dry winter conditions with a thick winter jacket could increase chances of discharge. Perhaps the in-ear design of the included CC earbuds–with silicon earpieces–will minimize and insulate you from this problem? Let us know! Thank you for your assessment of the CC Skywave, William! 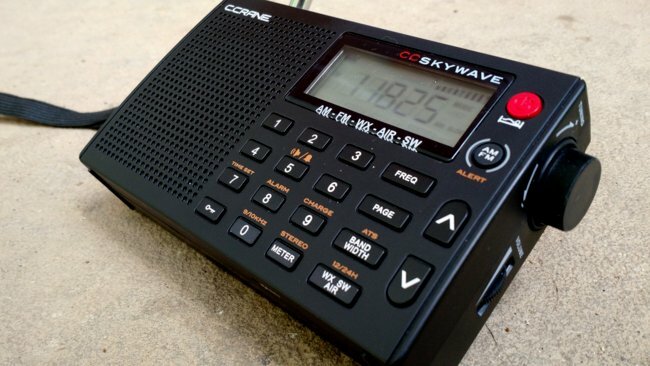 This entry was posted in Guest Posts, News, Portable Radio, Radios, Reviews, Shortwave Radio, Shortwave Radio Reviews, Ultralight DX and tagged ACARS, C.Crane CC Skywave, C.Crane CC Skywave Review, CC Skywave, CCrane CC Skywave, William Pietschman (W8LV) on November 16, 2015 by Thomas. ..can someone tell me, if I were to leave my apartment for the workday, will the NOAA stations come on by themselves, or can I disable them? Here in the North American Mid-west, you don’t really need NOAA stations!…maybe you do if you live in the Florida panhandle or tornado alley of Kansas, but I don’t like the NOAA stations! The Air Band is good to have, and LW, Japanese FM bands, and continuous AM (shortwave bands) are good, as well as Synchro detection would be nice! Another question, how does the CCrane Skywave and, Eton Traveller III compare to radios of the 1970’s?….RSVP!!! …thanks! You have to turn the “alert” feature on, otherwise NOAA won’t take over the radio. Skywave does not have the LW band. Differences? Size, more plastic, much better reception for the size, DSP blows away AM/FM reception from the seventies. With digital reception, it’s apples & oranges. Seventies’ radios might sound a little better because of their size, had stronger amps, but put on headphones and you’ll be blown away as well. KFI on a portable from Ohio. I have tried and tried to hear them from Virginia on my Perseus and Wellbrook loop. Never could hear them. Most of the time I hear a station in Ohio or a Cuban on 640.